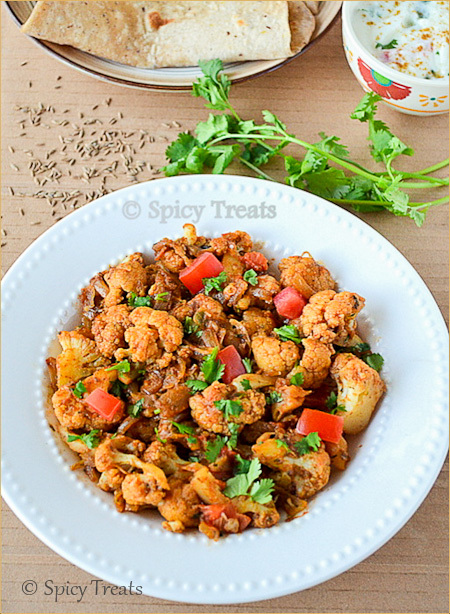 Again I am back with another interesting and flavor rich sabzi with Cauliflower/Gobi. This is a kind of dry sabzi with more onions and spices. I have a strong like/love to this combo - ginger,chilli,cilantro, the unique flavor n the strong spicy taste tempts me a lot....I have used this combination in many of my recipes like,Sweet corn Cilantro rice,Corn Adai,Gobi Paratha,Coconut chutney. I tried this recipe long back for Julie's EP series event ~ Cumin n cilantro but becoz of my health issue i couldn't able to send it in time. So Sorry dear!! I used blanched cauliflower florets for this sabzi and didin't cook it for long time, this way cauliflower stayed crunchy and absored all the spices and tasted so good. Do give it a try and let me know the result. I am almost normal but still walking n standing hurting my knee, so don't want to strain much but at the same wanted to keep my blog live i am sharing some recipes in my drafts. Like before i am not able to spend much time sitting n checking all my fellow blogger's recipes that's y i am not commenting on any of your blogs these days :( To keep myself active n engaged i am decided to come and check all yours at least once in a week. In a blender, take cilantro,ginger n chilli add few drops of water and blend it to a coarse paste n keep ready. Chop cauliflower in to small bite size florets and put in the boiling water for 5 minutes then drain and wash in cold water....drain completely and keep ready. (this way helps to cook cauliflower quicker n prevent soggy /mashed up). Now heat oil in a pan, add cumin seeds wait till it splutter and then add onions and saute till light golden brown. After that add, ground cilantro-chilli paste and turmeric powder n saute unitl raw smell leaves, for 1-2 minutes. Then add all dry powders and stir fry for 1-2 minutes. Now add blanched cauliflower florets and stir fry for 2-3 minutes. And add kasoori methi and stir fry for another 2minutes and lastly add some cilantro n diced tomato,combine well and turn off the stove. That's it...Jeera Gobi ready enjoy with hot rotis/puris/phulkas along with Cucumber Raitha. wow, that looks simple and delicious. Happy to see you at least once a week, the dish looks so perfect, love all the flavors that goes into it..
Looks super colorful and delicious. Simple and yet delicious preparation...looks tempting and colorful. looks very nice.. lovely clicks! Excellent jeera gobi,simply inviting super flavourful side dish for rotis..
Glad to see u back again,curry looks very nice,def perfect for rotis!! Lovely and delicious. Beautiful clicks. Without knowing u i commented so far , now i comment as ur frnd dear ;) It looks too good. Must give a try :)Awesome clicks !! These photos are gorgeous! It all looks so delicious! Yum! Delicious gobhi... Will try this one soon. Glad that you are back Sangee. Hope you are feeling better now. Looks super yummy Sangee....amazing pictures. I'm hosting this month's WTML event and giveaway. If interested, please link this entry at my space. It attracts me to check their taste when i see it. People like to take herbal nutritions with their diet. I think that it will be helpful to satisfy their need.